Cork flooring is one of the best flooring materials you can choose for your home. 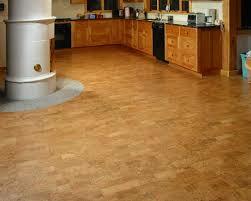 Cork flooring tiles are an excellent choice for kitchens, bathrooms, music rooms and bonus / family rooms. There are many cork flooring pros and cons, and types of cork flooring, and described below we break them down. Cork flooring is highly water resistant making it an excellent flooring option for kitchens and bathrooms. In addition, due to the fact that cork is a flexible material, it is an excellent flooring material in kitchens where there is the tendency to drop items. Unlike a ceramic tile floor, cork flooring tiles won’t crack when you drop a glass on them. Also, because cork material is flexible, it works as a great sound damper. Consequently it is ideal for rooms that would otherwise have the tendency to be loud, such as in a music room, or family room with a large vaulted ceiling. Cork flooring is also an excellent insulating material due to the fact that there are micro air pockets in it. Coupled with the fact that it is water resistant, Cork is an ideal flooring material for concrete slab floors. Cork flooring tiles are also easy to care for. A well polyurethane coated cork floor only requires regular sweeping or vacuuming. Liquid spills can be cleaned up with a damp cloth or rag. Cork flooring is also anti-allergenic and highly abrasion resistant. In addition, cork flooring is insect resistant. Cork flooring is also environmentally friendly due to the fact that only the cork bark is harvested, and not the tree itself. Cork flooring tiles also come in a myriad of colors, patterns and sizes. They can be purchased with beveled edges or pre-sealed with a polyurethane coating. There are a few cork flooring problems to consider before deciding to choose it. Due to the fact that cork is a softer material, permanent dents can be left behind. Thus the legs of heavy furniture, such as sofas and chairs, should have furniture pads placed underneath them. Also, like with any wood flooring water should not be left standing on it. Thus cork flooring should not be used in the basement. 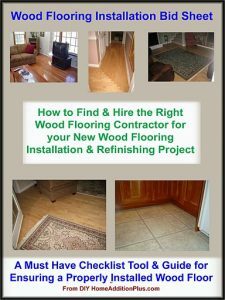 Cork flooring is easy to install and is competitively priced relative to hardwood flooring or higher quality laminate flooring. It is installed with glue and can easily be cut to work around corners.